What are marketing or business dashboards (or Business Intelligence Dashboards)? They are one of the best ways to visualize your progress and quantify your performance in different areas of the business. You can build these reports to display the data that you want to help you make the decisions you want. They are great because they simply display the information in one place so that you do not have to go to multiple people, platforms, and databases to get the information you need. 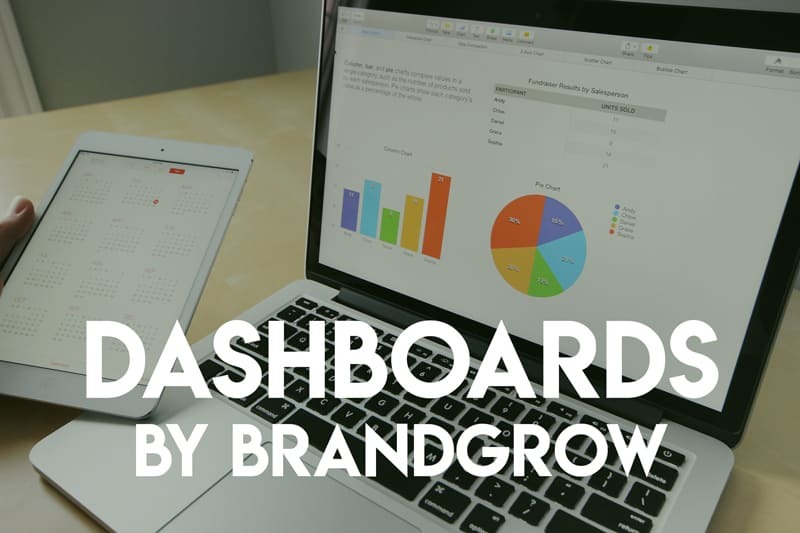 At BrandGrow we help you build dashboards either as a standard or customized package for you and your business. Learn more here. What are popular marketing dashboards? There are main dashboarding solutions out there and as long as your data can integrate with the dashboarding tool, it is possible to see all of this data in one place. Some of the popular marketing dashboards are Google Analytics, Salesforce, Tableau, (FULL LIST BELOW). Do marketing and finance dashboards overlap? In many cases, yes. Depending on the purpose of your dashboard, you will want to see both your expenses and revenue generated from the dashboards. This can be done by combining data from inputs like Quickbooks, Freshbooks or other applications to compare with revenue generated from each of the marketing channels which you are tracking. What is the purpose of a marketing dashboard? As a manager, director or executive, you may find yourself trying to understand your budget so that you can better plan for the upcoming month, quarter or year. The dashboard is a quick and reliable way to see your progress over time. When you first start, choose some benchmarks so that you can see the performance as you progress through the year. What metrics, segments, and data should I use? There is no clear-cut answer to this because it depends on your strategy. Although, it is best to start with your most important, decision-making metrics and use those. Then you can drill down further into other metrics based on what you need to know about individual channels or tactics. Customer Lifetime Value, Acquisition Costs, and Annual Recurring Revenue are some great places to start for any business but are not specific to marketing. Marketing metrics usually include Cost per Click (advertising), Cost per Conversion, and other engagement oriented types of metrics which help you see the value of your brand in the eyes of your potential customers. Marketing can help you plan to increase those metrics, but it better when it is approached as a team. What are the types of marketing dashboards? AdWords Marketing Campaign Dashboard: Easily see your ROI for a given campaign. This dashboard includes a high-level picture and easily drill down into ad metrics like click-through rates and ad placement allow you to understand the effectiveness of ad text and bidding strategies. Other metrics you can track on this dashboard would be bounce rates, time on page, and conversion rates allow you to see potential opportunities for improvement. More about PPC and other ad types. CMO Marketing Dashboard: This is where you track the most important KPIs for your marketing team. You are in control and this dashboard gives you the tools you need to see the complete picture of your marketing performance. You can easily check into daily performance and react to campaigns as they are executed. You may choose to tie in revenue, customer acquisition, churn and other business KPIs and tie them back to marketing efforts in a visual way. More about fractional CMO services. Content Performance Marketing Dashboard: It is tough to measure content and branding based on metrics, but they do play a role in understanding what your customers want to engage with. You can track quality by how much it is being shared, engagement rates, inbound links, and organic traffic. But what’s most important? Uncovering whether or not content marketing is helping to generate more business. More about content marketing services. Digital Marketing Dashboard: In order to see all the channels and how they are working together you can aggregate all of your digital marketing activities, your product or service offerings, and marketing metrics from all of your key platforms. See your Google Analytics traffic, Adwords, Facebook, Twitter, Linkedin, Programmatic Ads, Partner Channels, Referrals and many other channels. Learn more about digital marketing services. Email Marketing Dashboard: These dashboards show reports of important metrics and performance of your email campaigns. Usually, you will want to see metrics like open and click rates, and the number of leads generated (Sometimes sale attribution for e-commerce sites). This report allows you to see your increase in subscribers, which campaigns are doing the best and ensuring your emails are being seen in the inbox. Learn more about email marketing services. Lead Generation Dashboard: Lead generation is the name of the game in marketing. This type of dashboard is good for a generic view of where the leads are coming from, their attributes, and gives you a jumping off point into learning more about your leads. Marketing Channel Analysis Dashboard: Similar to the digital marketing dashboard, you can see multiple channels of inbound marketing such as SEO, SEM, Content, Referrals, and Social Media Marketing. The difference here is this dashboard is designed to give executives insight into how efforts are paying off. It does that by displaying which campaigns are producing the results you want. This dashboard gives you the ability to monitor and compare performance across various marketing channels and campaigns from a single page. Learn more about Fractional CMO. Marketing KPI Dashboard: Using your Key Performance Indicators (KPI) to show you the nitty gritty of your marketing efforts. Simply showing what is working and what isn’t without other metrics taking up space on the dashboard. This is a good way for teams to stay aligned with what the goals are for each of the team members. Learn more about our marketing advisory services. Marketing Qualified Lead (MQL) Dashboard: Qualified leads are those which the company has decided are worth pursuing more than other leads. Qualifying them usually comes with a set of parameters that the leads meet and they progress through the sales funnel after that point. Usually, a marketing automation system helps you trigger the qualification of a lead to the MQL stage, like demo requests or downloads. Having this half of the funnel can give you insight into where your qualified leads are coming from, the volume, and comparisons to other timeframes, channels, and sources. Learn more about our marketing advisory services. Sales Qualified Leads (SQLs) Dashboard: SQL’s are part of the second half of the funnel which is considered the sales stage. These dashboards will help your sales and marketing teams stay in sync about lead volume and quality being fed to the sales team. Learn more about our marketing advisory services. SEO Marketing Dashboard: The aim is to monitor important facets of SEO for easier management. It’s especially useful if you’re working on multiple websites because it can help you to easily monitor your overall organic search reach, top landing pages, and which keywords are the most valuable. Learn more about our marketing advisory services. Social Media Monitoring Dashboard: Understand the rate at which your social media channels are increasing followers, increasing engagement and even potential conversions from these channels. Popular tracked social media channels are Facebook, Linkedin, Twitter, Pinterest, Youtube, and many others. You can also focus on just the channels you need to grow depending on your type of customer. Web Analytics Metrics: Organizations often use Web analytics software to measure how many people visited their site, how many of those visitors were unique visitors, how they came to the site (i.e., if they followed a link to get to the site or came there directly), what keywords they searched with on the site’s search engine, how long they stayed on a given page or on the entire site and what links they clicked on and when they left the site. This is an important activity as too often social marketers focus on their success on a particular platform instead of seeing their performance within the larger context. What are the types of dashboard metrics? Below are a mash-up of different available metrics and segments which are commonly used in marketing and sales dashboards. Lead source, open opportunities, SQLs & MQLs, lead stage, industry, location, budget (or applicable contract amount), conversion rate, conversion totals, conversion costs, engagement rate, cost per engagement, impressions, clicks, cost per click, click to conversion rate, time on site, time on page, bounce rate, exit rate, returning visitors, multi-channel touch points, lead score, campaign to opportunities influence, open rates, click rates, click to open rate, deliverability, inbox placement, and many others.